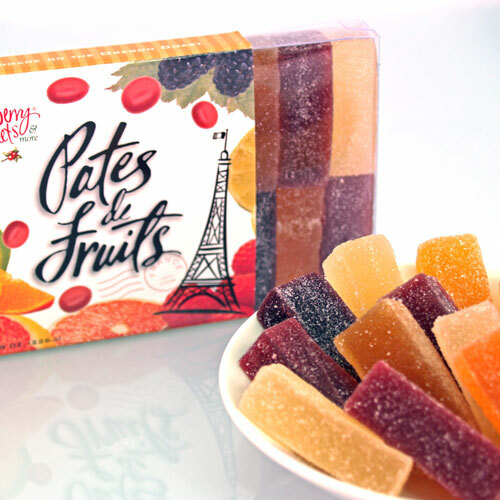 Domestic Pates de Fruits handmade in small batches from pure fruit and fruit juices. The blackberry, cranberry, key lime, orange, raspberry, and ruby red grapefruit flavors remain clean and bright because fruit pectin is used to thicken the fruit mixtures. It take several weeks to produce this high-quality confection, so it's understandable that lower quality jelly candies rely on corn starch or other thickeners to speed up the process. But only pectin yields the pleasing jelly texture and sparkling flavor we love so much. Lightly dusted with sugar and hand-packed in a clear box for a colorful display of jewel-like sweets. Ingredients: Cane sugar, cranberries and cranberry juice, marion blackberries and marion blackberry juice, raspberries and raspberry juice, key lime juice, ruby red grapefruit juice, corn syrup, pectin, orange oil, lime oil, grapefruit oil and tartaric acid. Love these beautiful fruit jelly candies!! Great taste!! These little fruit sweets are lovely. Intense fruit flavor and a nice texture. This is my second time to order these because I want to share over the holidays. Yum!